For more than 40 years, Don Barber built ocean going wood boats in the Pacific Northwest community of Coos Bay, Oregon. 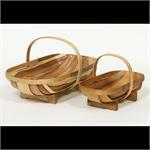 In 1979 Don retired from shipbuilding and started a family business handcrafting baskets out of rare myrtlewood. We are still a family business. Our founding fathers are gone now but many of the same tools and skills used in boat building are still in use at the basket shop today. Some of the original Barber's Baskets are still in use at the basket shop too. People say "These are collectors items!" And you know, they are right - we collect them.....and use them daily. That is what makes them special to us and to the many people who have wrote to us with their kind words of appreciation. Thanks to all who have taken the time to let us know how they feel about their Barber's Basket! Hi, The trug arrived the other day in fine condition. It's beautiful. Beautiful wood and beautiful craftsmanship. Thank you very much, Susan H.
Hello, I just received a beautiful Barber Basket as a surprise gift and I am so excited! Our friend, who was raised in Oregon, was recently married. My husband and I catered the rehearsal dinner and as a thank you our friend's mom sent one of your incredible garden trugs. I love it and can't wait to use it for bread at our next event! Thanks, Suanne S. ....I would like to order a small trug basket and have it sent to my Mother. I bought a large trug from you last Sept. and when she came to visit kept commenting on how much she liked it. Thanks so much. By the way, we love our basket. We have it on the kitchen counter filled with whatever is in season. My Mom saw it filled with acorn and butternut squash we picked from our garden last fall! We also bought a drift dory for the bathroom counter, filled with fingertip towels. They both look great! Lori C.
...the trug arrived in time for my father in-law's birthday. It was a very successful gift - he loved it! He really admired the craftsmanship, the copper nails and the beautiful Myrtlewood. My husband and I would like to order a large and a small trug for ourselves. We go to the farmer's markets and think the trugs will be the perfect market basket. Can't wait - thanks again. Nancy L.
My trug arrived this morning. So beautiful. I love having a handcrafted piece of functional art in my kitchen. Thank you for creating things with such love and fine craftsmanship. Laurel B.
I just received your beautiful Coos Bay Trugs. I am so glad to discover that such fine quality work still exists. The trugs are beautiful and I will treasure them. I ordered them at the end of the day on Tuesday, March 31 and they arrived this morning, Monday, of April 6. Remarkable delivery time! I am so happy. I needed them for cutting and pruning my rose garden. I will buy more and give them as gifts. They are superb, and I am overjoyed to have them. Yours truly, Barbara M.
This is the 5th Trug I have bought from you. This one is for my son's wedding. I can only thank you for making such a wonderful product that I am proud to give to family and friends. Art C.